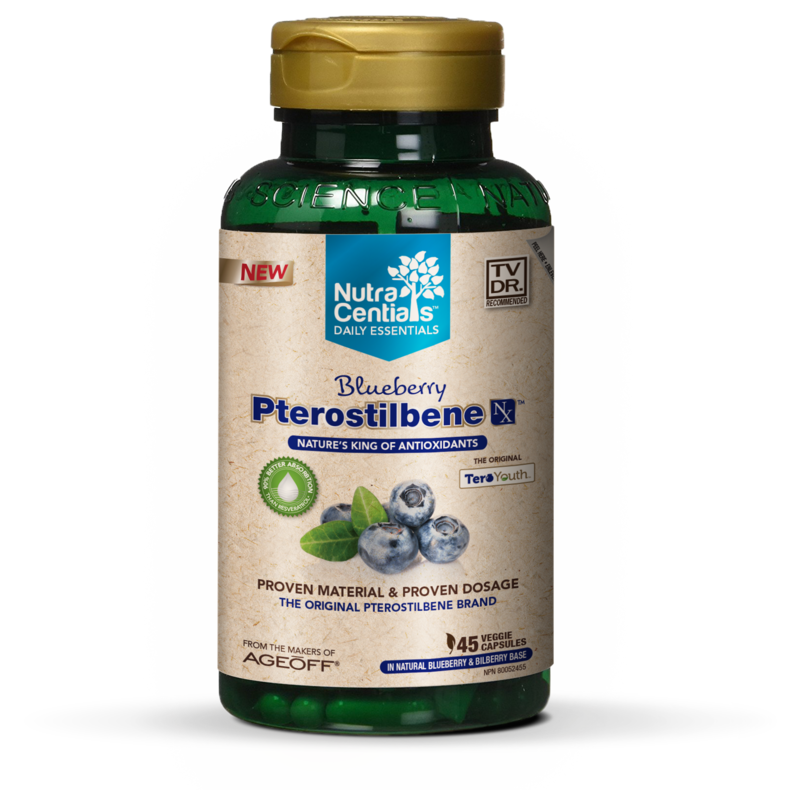 To get a clinically proven amount of Pterostilbene you would need to consumer more than 500 cartons of blueberries. 1. Made exclusively with TeroYouth - the proven form of Blueberry Pterostilbene that will provide the true benefits this amazing nutrient does for the body. 2. Lasts longer in the body and has superior cellular uptake compared to the other antioxidants. Compared to resveratrol, Pterostilbene is 90% better absorbed, has a 3. 7 times longer half-life, and has up to 4 times greater cellular uptake. 5. Promotes heart health by maintaining healthy blood pressure levels. RECOMMENDED DOSE: Take 1-2 capsules twice daily. RECOMMENDED DURATION ON USE: Consult a health care practitioner for use beyond 8 weeks. RECOMMENDED USE OR PURPOSE: Provides antioxidants. I have noticed since taking the Blueberry Pterostilbene that my blood pressure has gone down along with my anxiety has reduced quite a bit. I also have noticed that my memory is getting better. I would definitely recommend this product for everybody! I'm looking forward to receiving my free bottle of Blueberry Pterostilbene Nx. Energy back, muscle aches gone, Cortisol levels down and sleeping better! For the past 9 months I've been seeing an Naturopath and a physician specialising in Bio-Identical hormones for hot flashes and inability to sleep. I was put on various hormones, a Gabba formula for sleep and a stress formula for high Cortisol levels. I was able to wean off the sleeping pills with the help of the Gabba formula but my sleeping still wasn't great. After 6 months I had my blood tested which showed my hormones in balance but my Cortisol levels remained high. 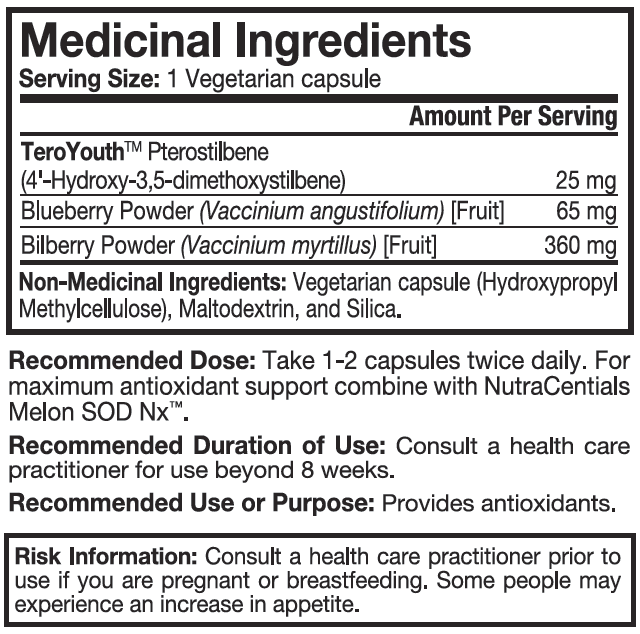 I decided to stop taking the stress formula and introduced 2 Melon SOD's and 2 Blueberry Pterostilbenes at breakfast. After about 4 weeks my sleeping began to improve and in another 5 weeks I had my blood tested again. This time it showed that my Cortisol levels had drastically reduced! The Melon and Blueberry supplements are a winning combo! Copyright 2015 NuvoCare. All Rights Reserved.